The new Freedom is smaller, lighter, sturdier and less expensive than other models while remaining the only fully ADA and Title 24 compliant restroom on the market. With this many benefits, operators will find the new Freedom easier to handle, maintain and afford. To improve handling and quality, the Freedom is fifty pounds lighter and has a unique front design featuring “living hinge” corners and a built-in, interlocking door hinge to eliminate door sag. The living hinge on each front corner acts like a shock absorber when struck by a forklift or dropped off a trailer. 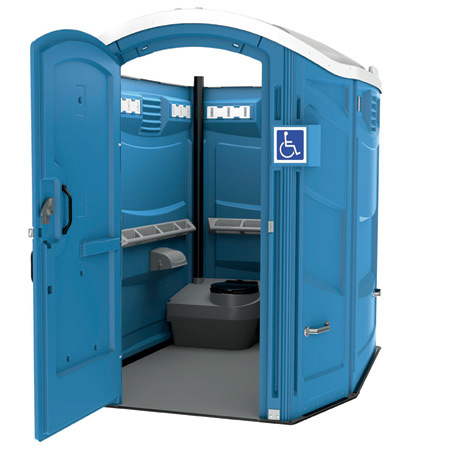 Additionally, the capped roof and stainless steel front floor brackets combine with the front to form a superior ADA restroom.